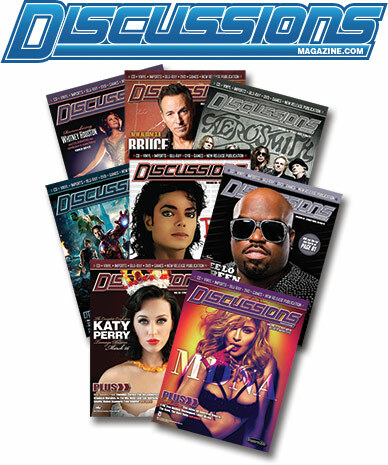 Discussions Magazine Music Blog: DISCUSSIONS MAGAZINE: Subscribe now! It's FREE! DISCUSSIONS MAGAZINE: Subscribe now! It's FREE! What can you possibly get for free these days? By the looks of it, society has changed so much that there is very little you can get for free nowadays. Sometimes, if you are lucky, you can buy one of something and get another one of those things (of equal or lesser value) for free, but even that deal seems to be dwindling away. But I’ve got GREAT news. You can now get the digital version of DISCUSSIONS MAGAZINE sent free to your e-mail box each and every week! Yes, that’s right! FREE! But what is DISCUSSIONS MAGAZINE? It’s a weekly digital magazine that keeps you informed on entertainment-themed releases on all formats including CDs, Blu-Rays, DVDs, vinyl and video games. If you subscribe to DISCUSSIONS, you’ll never miss a new release again! Amaze your friends with your in-depth, first-hand knowledge of all things new, hip and exciting! As an added bonus, you'll also have access to EXCLUSIVE interviews that can only be found in DISCUSSIONS! So, now that you don’t have to pay any money for DISCUSSIONS MAGAZINE, the only thing we ask in return is that you pay ATTENTION to all the great releases, support the entertainment industry and go out and buy stuff! Entertainment adds joy to your life. We’ve just made it a lot easier and cheaper (ie: FREE) to stay in touch with the things that make you happy! SUBSCRIBE NOW! JUST CLICK HERE!